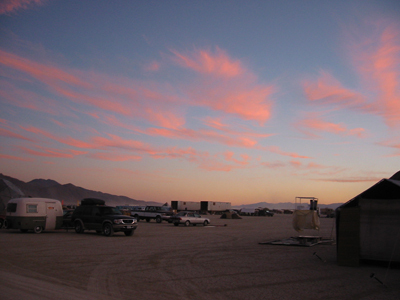 The sun, on the playa, is like the fridge light to the cockroaches. It comes on and the roaches scurry for safety. In our case, we scurry under shade and drink lots of water. Sometimes venturing out into the daytime world to see the sights, or work our shifts. Mostly, however, we just sit under our shade and drink our water and plan our evening. The sun setting is a hallowed event. Usually there is yelling or screaming or cannon fire or heavy drinking. We aren’t particularly loud, and we didn’t have a cannon, so we opted for the heavy drinking. At least 3 of the nights we were out there we could go out onto the street and, as the sun set, throw back shots of 151. Not a bad way to start things. To watch the cannons fire was intriguing. You would hear the sound and see a black mushroom cloud appear from the ground. 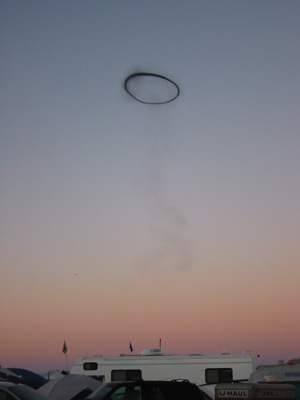 The force of the blast with enough upward momentum to “spin” the cloud away and congeal into a ring. It was really cool. 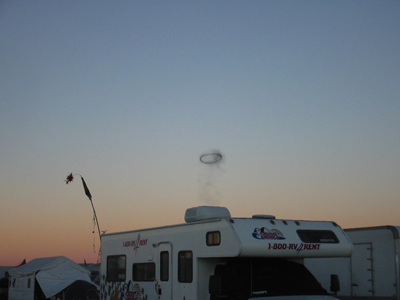 And as the rings ascended and eventually dissipated, you were left with the pink clouded sky. The last signs of the day that had kept the cities occupants under wraps. Who were now emerging and beginning the night long party that would eventually welcome the sun back the following day.